Round tomatoes cut into wedges, salted, placed out in the sun to dry slightly, seasoned with garlic and oregano and packed in oil without vinegar. Their flavor is delicate and sweet. 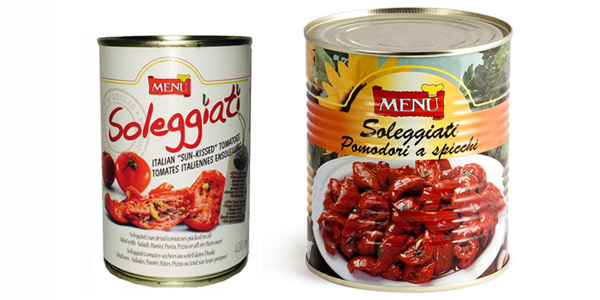 This is a traditional product of Southern Italy, where the tomatoes are baked in the oven and packed in jars with oil. They may be served cold, as a side dish, as a topping on pizza or sandwiches, on canapés or as antipasto. Perfect in a salad buffet with other vegetables, ideal as a side dish for meat. The special tin with a lining of simil-china avoids tomatoes having the metal taste and maintains their original full-taste.